You can add “new” milk to previously chilled or frozen milk. Chill the “new” milk before adding it to the container of milk. The expiration of the milk will now be when the original milk was expressed. You can add fresh milk to previously frozen milk as long as the fresh milk is chilled for an hour. 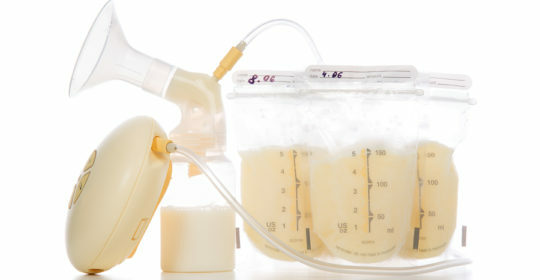 Breastmilk can be thawed in lukewarm water in a few minutes. It can be warmed to serving temperature after thawing it but never make it warmer than room temperature. You may notice that the milk separates if it’s been frozen for a while – don’t worry. Give it a gentle shake after thawing it. You can freeze small amounts in a covered ice cube tray. Smaller quantities defrost quickly and are perfect to add some breastmilk to mix with food when your baby is eating solid foods. Never microwave breast milk and Never refreeze breast milk once it’s thawed. If you are ever have questions, please don’t hesitate to call our office to talk to Maureen Mills, RN, IBCLC our Board Certified Lactation Consultant or schedule an appointment with her for feeding help/ Call 301-279-6750 or visit our lactation services page to view all of the newborn breastfeeding resources that we have to offer. Please join us on the second and fourth Wednesdays of each month for our Newborn Support Group run by Maureen Mills!